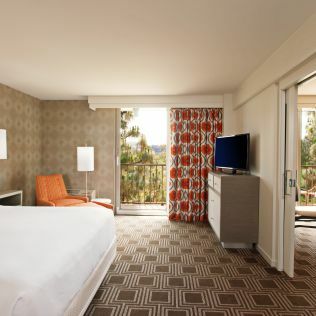 The bright lights and big views of L.A. are beckoning you from your two balconies. And once ensconced within your 650-square-foot suite, you’ll have privacy, comfort and true peace and quiet. Kick off your shoes, order up a bottle of champagne, take in the stunning views from both of your 7th floor balconies and then sink into the spacious comfort of your one bedroom suite. Romp, play and entertain in this retro-cool, spacious suite that offers you two private balconies, separate bedroom, spacious living area and bright sunshine pouring in from your floor-to-ceiling sliding glass doors.